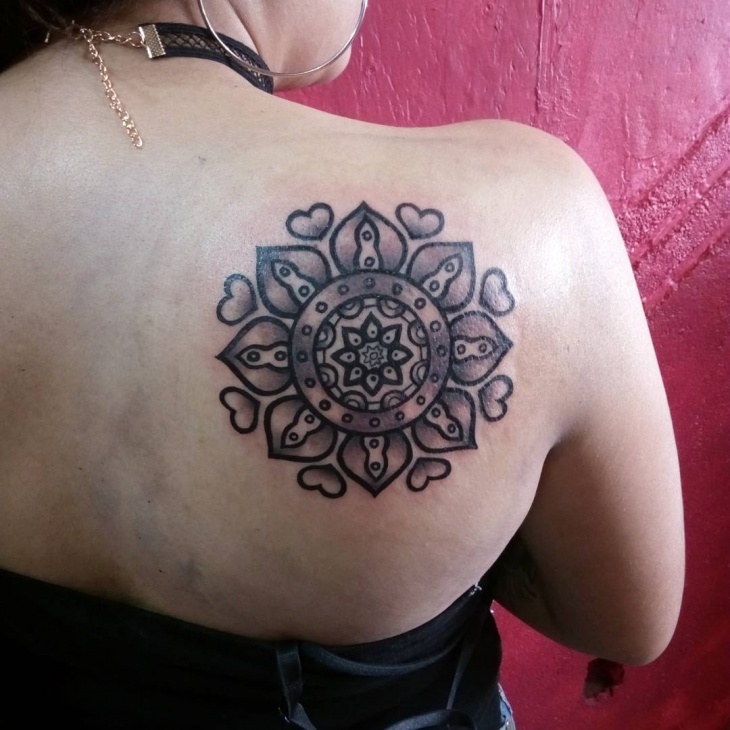 Mandala tattoo has an exotic yet sacred look that will easily adorn a body. While Mandala symbols often feature geometric shapes like a triangle or square, the circle is the prominent symbol which signifies unity, wholeness, balance and perfection. 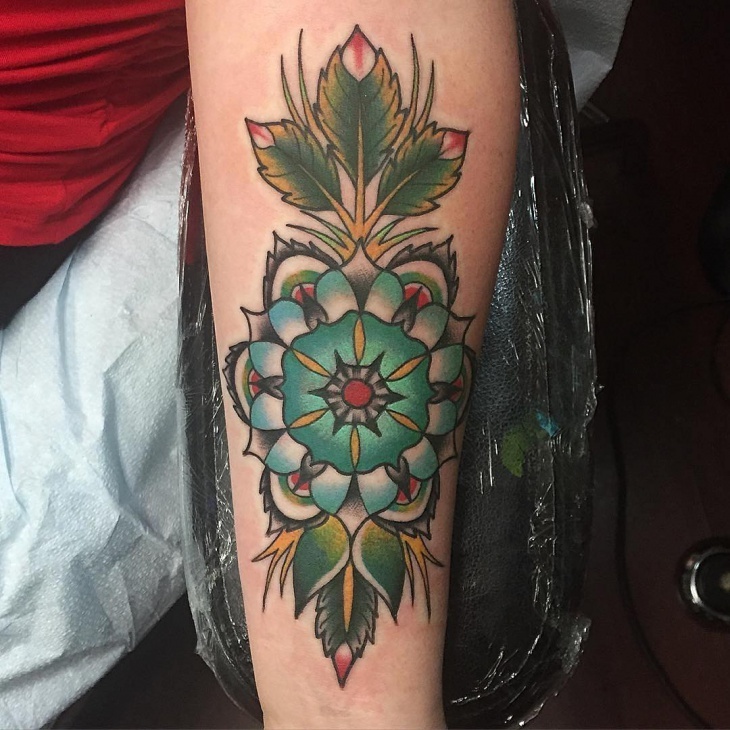 These tattoo designs are done from the center outwards giving them a floral appearance that makes the body visually appealing. 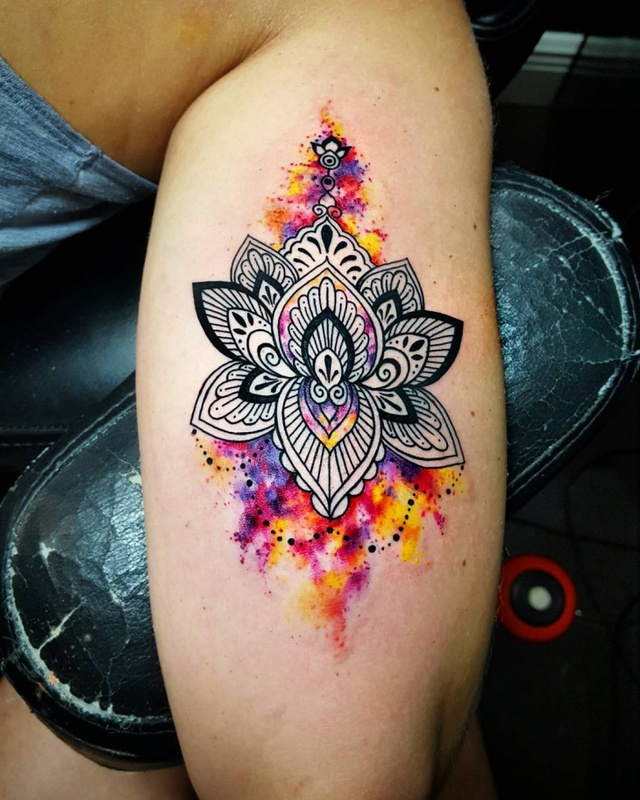 A Mandala is a prominent feature in Hindu and Buddhist religions, giving these tattoos a ritual image and spiritual symbolic meaning. 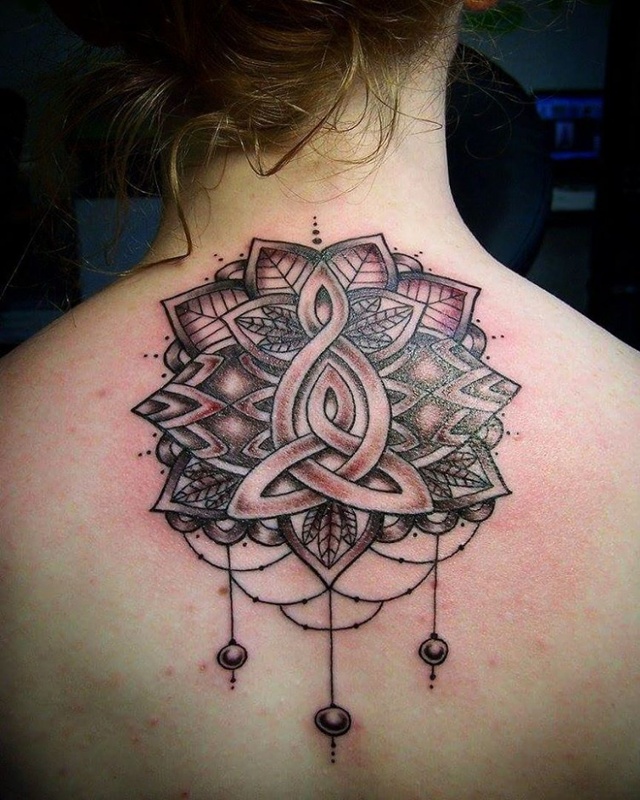 Celtic tattoos tend to feature circular knot work making this style perfect for inking a Mandala tattoo. According to the Celts, symbols were important as they held powerful meanings and reflected their traditions. These tattoos feature a triskele symbol which depicts continuity. Geometric shapes are trendy even in modern tattoo designs. 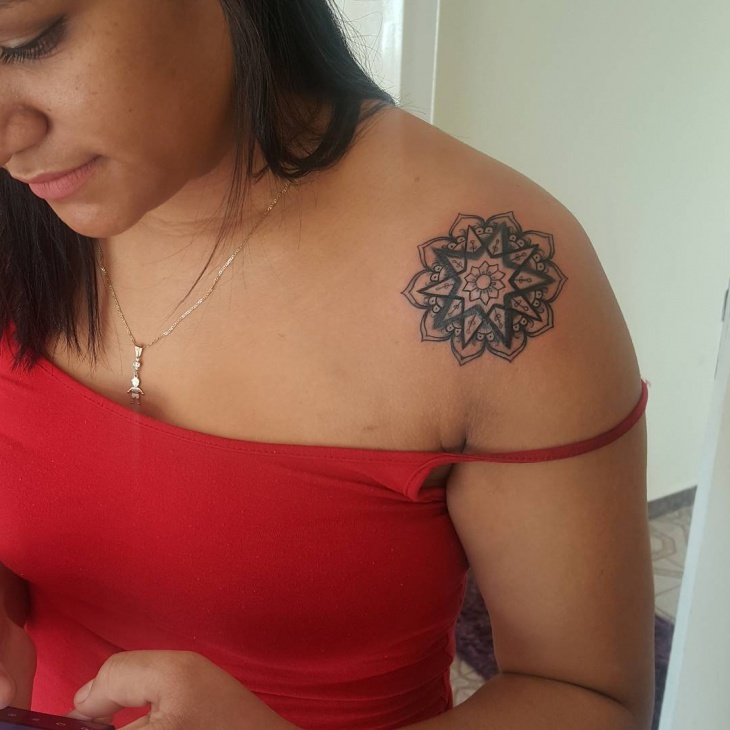 Mandala tattoos incorporate different geometric shapes, such as triangle, circle and square whereby each form carries a personal meaning to the bearer. The lines and complexity of the design make this tattoo unisex. 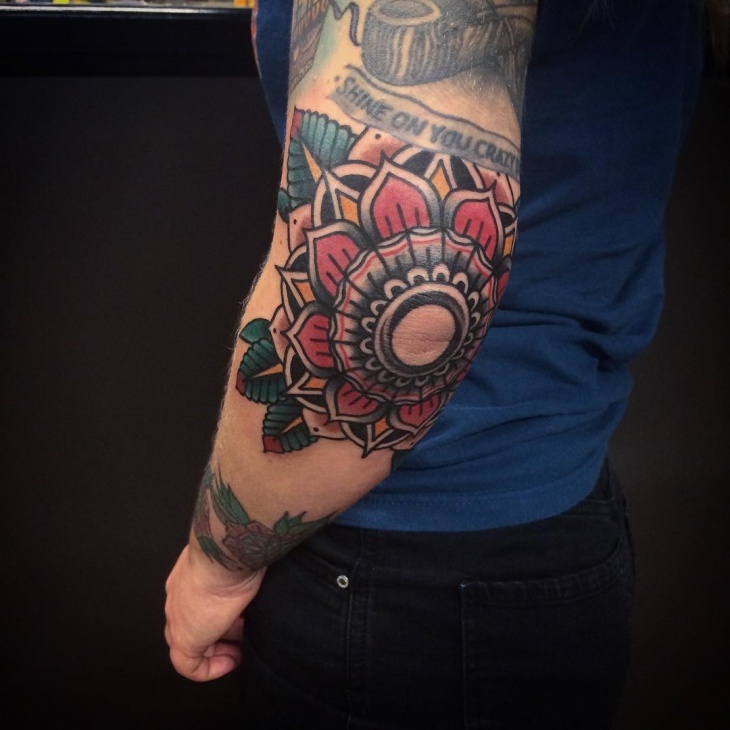 If you love flower tattoos but want one with religious meaning, then opt for Mandala tattoos. 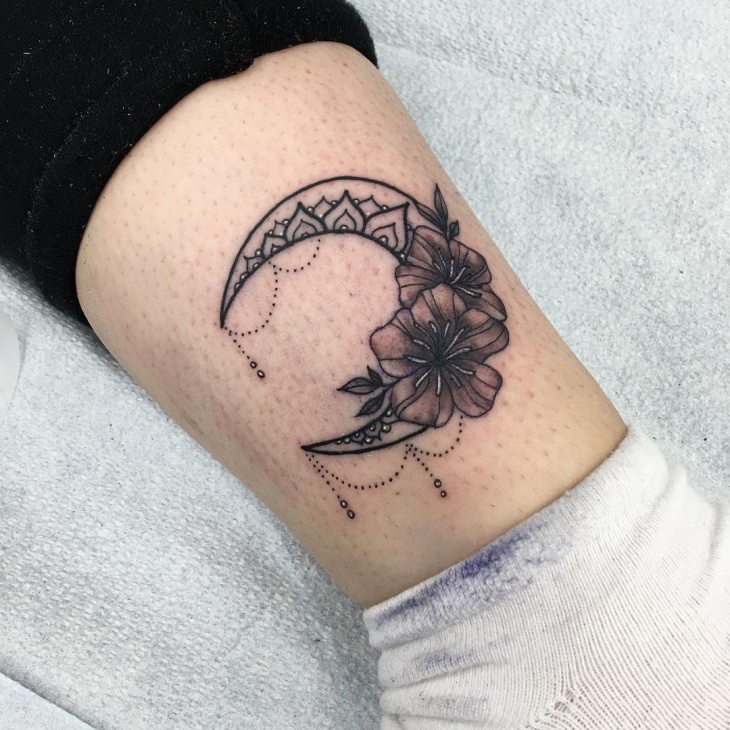 These tattoos feature circular floral patterns which are usually inked from the center towards the outwards giving them a feminine look that is perfect for ladies. 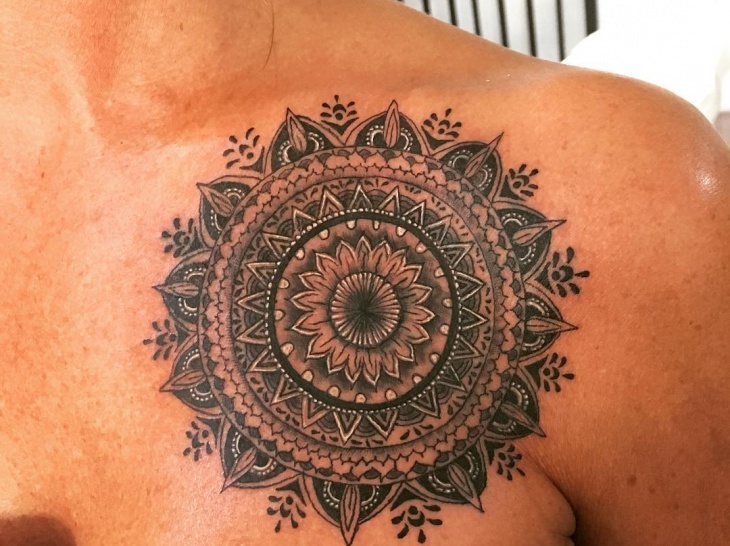 Mandala Tattoos integrate circle shapes which will look fantastic on a flat surface. 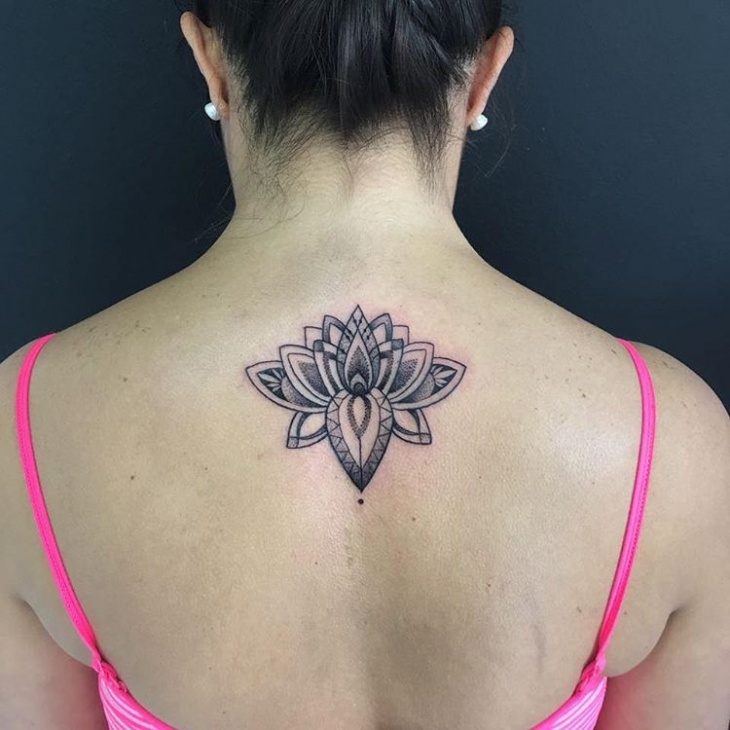 The neck is curvy and very sensitive and so when getting this tattoo make sure it is done by an expert tattoo artist who will not distort the shape. 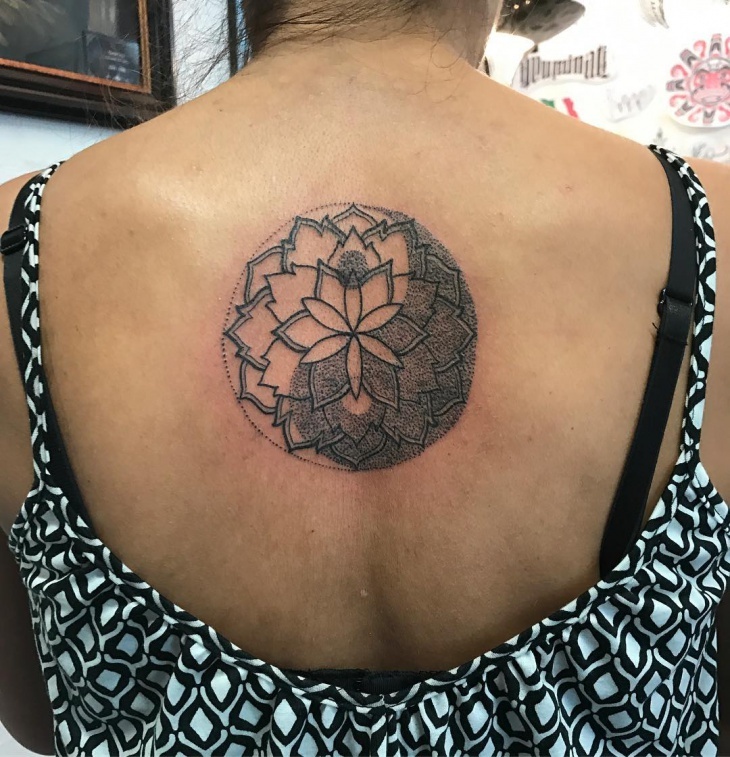 The back provides a vast and flat canvas for inking a Mandala tattoo because it prevents the shape from being distorted. While black ink will look good on any gender and suits men, women can go for those designs done in red ink. 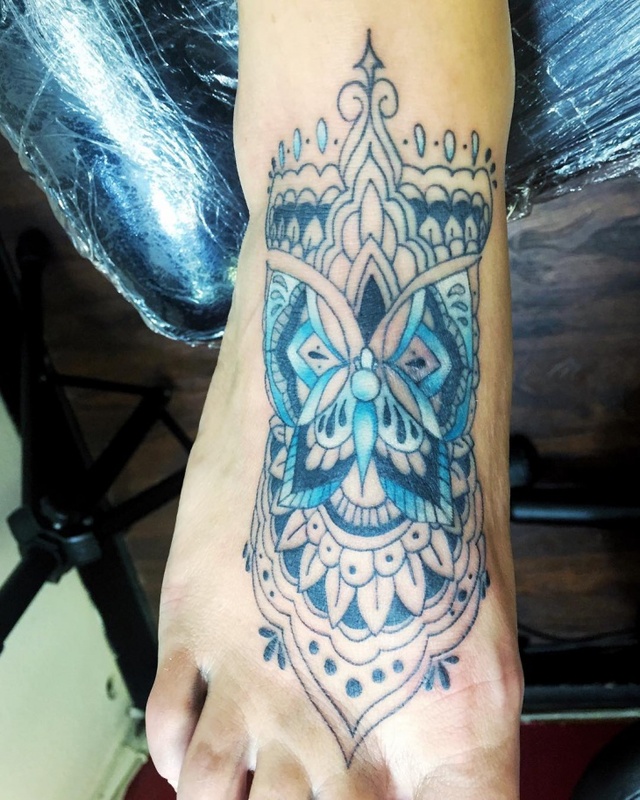 Traditional Mandala tattoos represent the actual form of Mandalas. Circles at the center and a square with four gates are often seen in these tattoos and are inked mainly to express spiritual beliefs. You can even go for a temporary Mandala henna tattoo when attending a wedding. 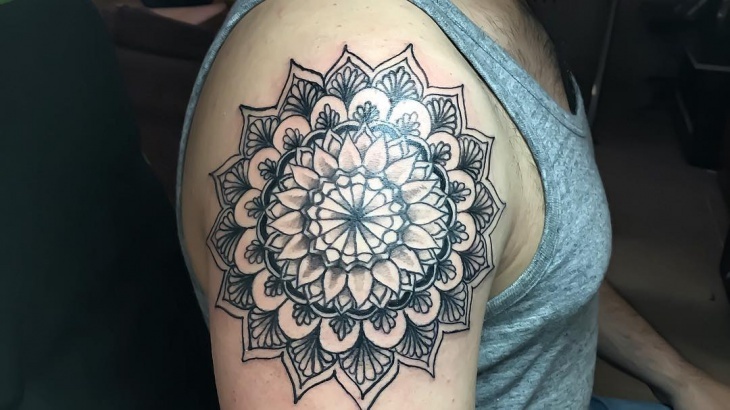 Small Mandala tattoo designs are for people who love tattoos or those getting a tattoo for the first time. They carry the same symbolic meaning as large designs and work to decorate that particular body part. Ink this tattoo on the finger, behind the ear and wrist. 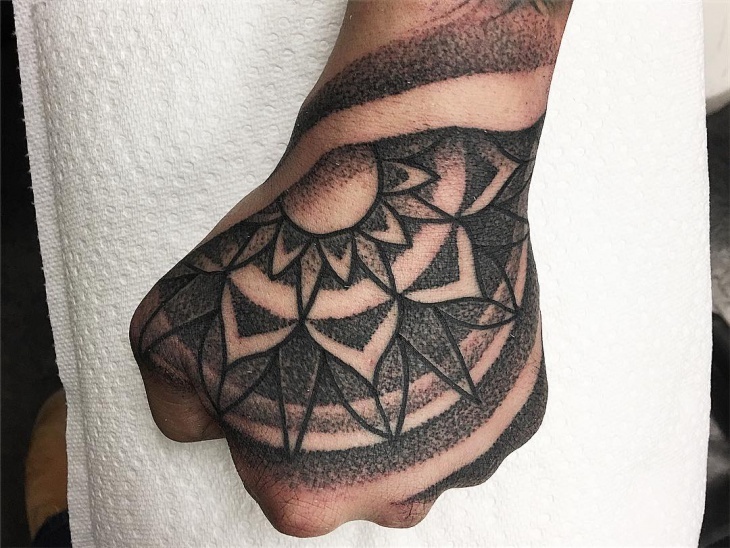 Mandala arm tattoos done in black, or gray ink are suitable for men. While they add to enhance the visual look, the arm also has adequate space on which you can integrate other designs such as celestial bodies, bees or arrows. 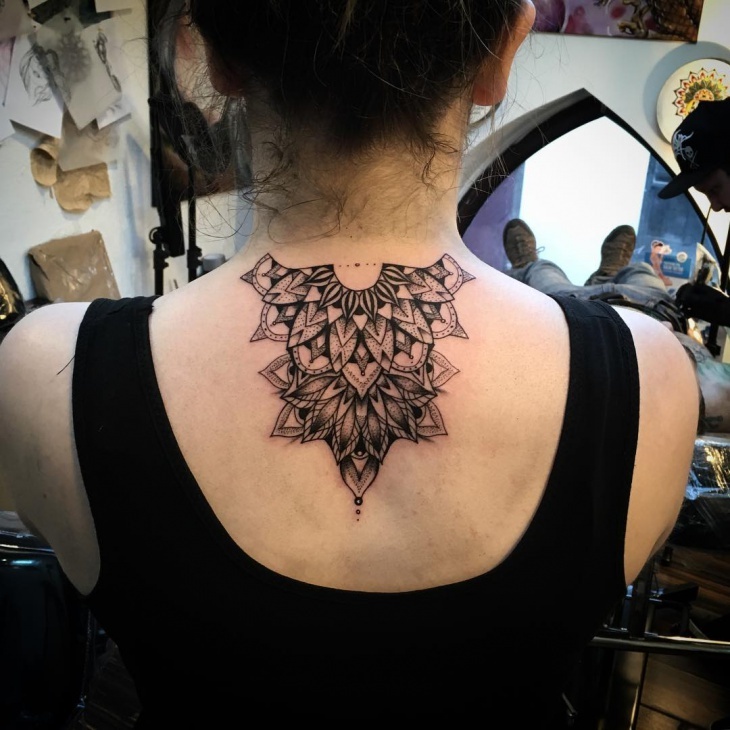 Use Mandala shoulder tattoo designs to express your spiritual path. These tattoos can also work to tell a religious story of where a person has been in life and where they are going. In some cases, an individual’s spiritual journey can be portrayed. Butterflies are beautiful insects that represent beauty and rebirth. If you have found a new spiritual path, then you can highlight it using butterfly Mandala tattoos. Adding a butterfly helps to show the close relation with flowers. 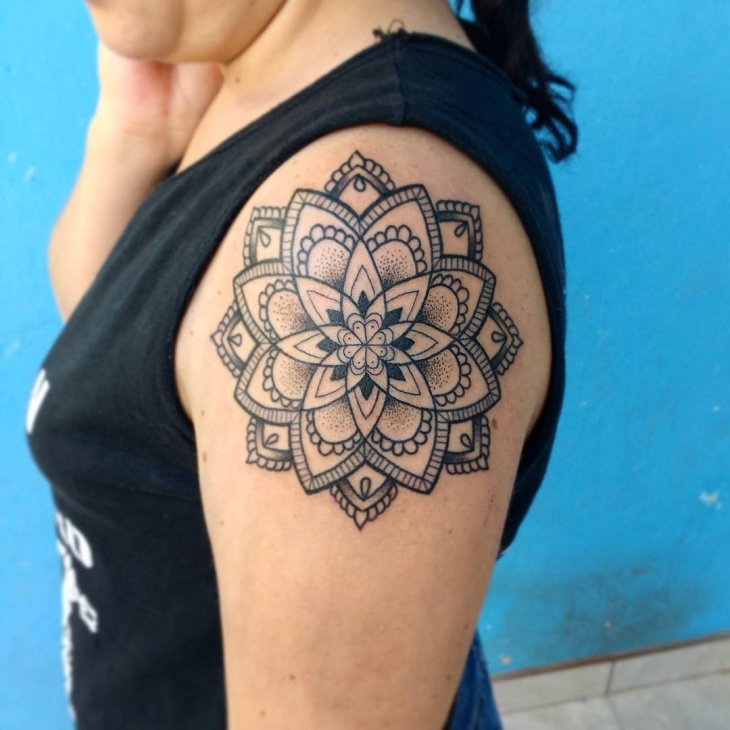 If you want to show that Mandala tattoos are feminine, then go for a lace design. These tattoos are suitable for ladies and they depict both the delicate nature of the Mandala and lace. They can act as a way for a person to celebrate their femininity. Both feathers and Mandalas are prominent symbols in Native American culture. 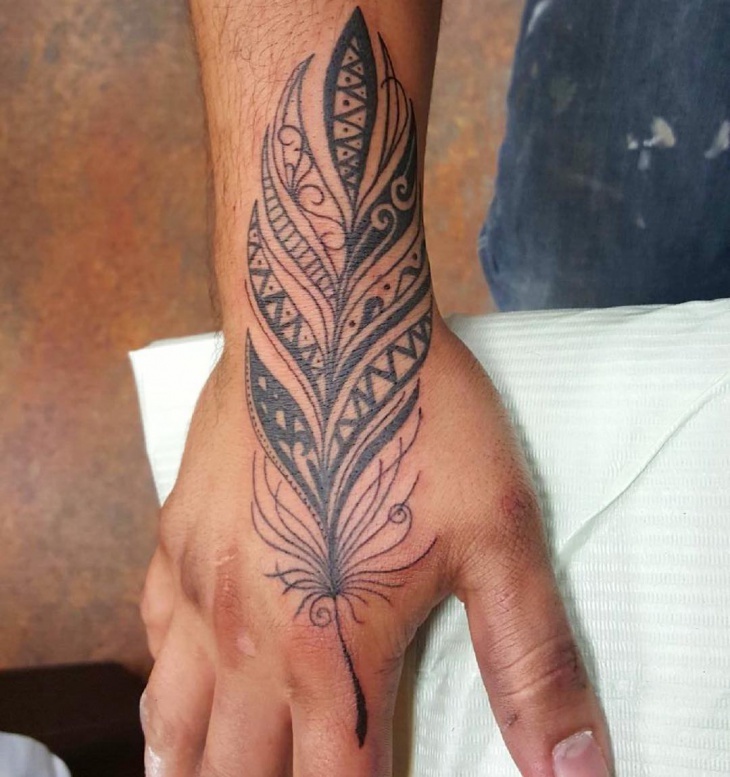 So if you prefer tribal tattoos, then feather Mandala tattoos are perfect for you. For an edgier design decorate the circle with red color and give your feather compass points. 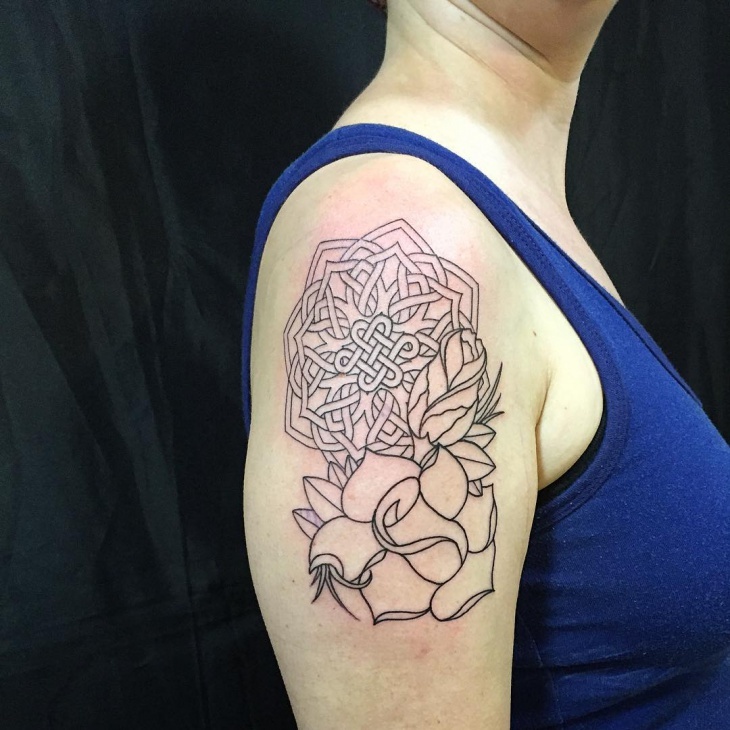 Draw a Mandala tattoo with a lotus flower as the centerpiece to show a blossoming life. 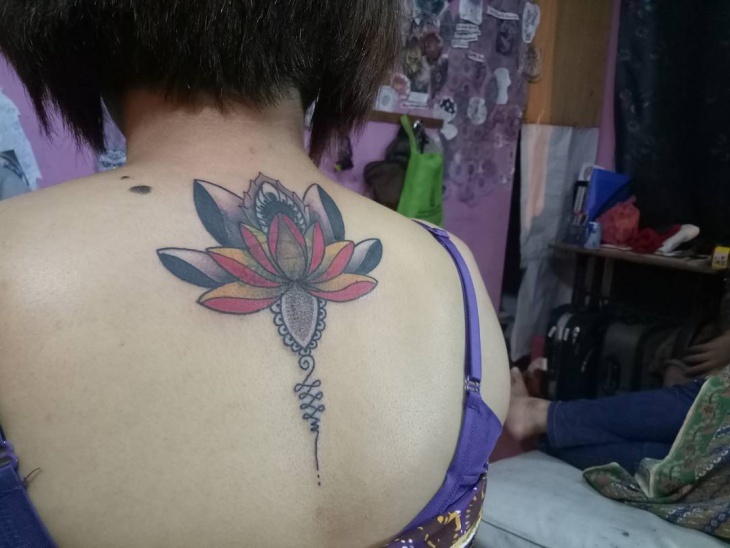 Adding a lotus flower tattoo besides the Mandala is also another way you can ink your design. 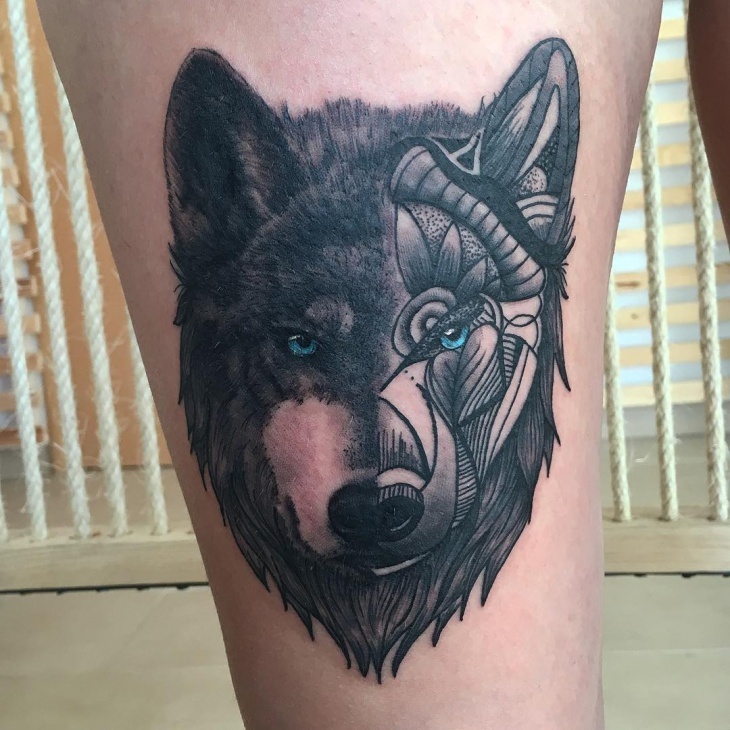 Combining a wolf with a Mandala tattoo is an excellent way to show the guidance of the animal spirit. You can add a Mandala crown on top of wolfs head or make wolfs head the centerpiece of the Mandala tattoo. 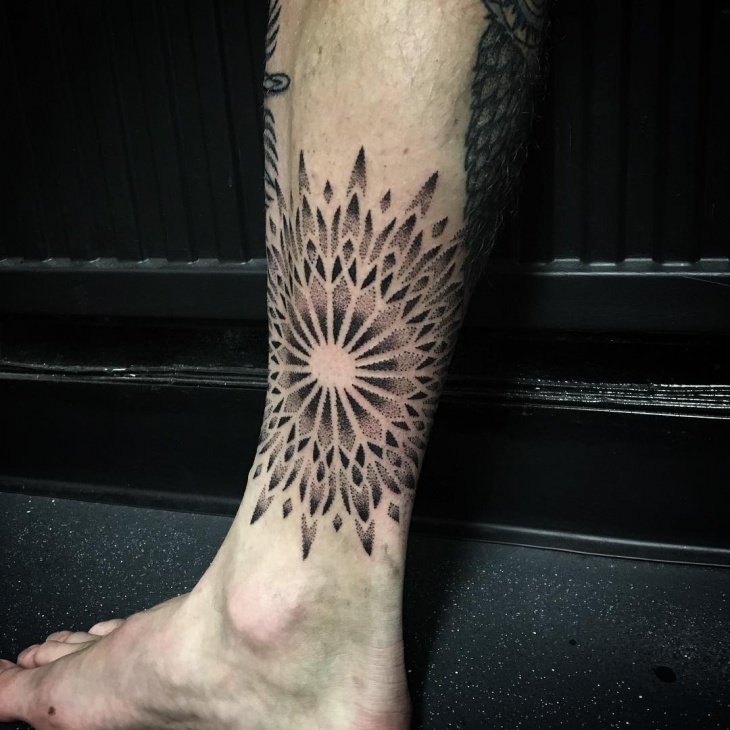 Legs provide the space on which a person can ink a Mandala tattoo to show appreciation for cultural beliefs and sacred geometry. To increase the visual appeal of the leg, choose to ink your design with some of the petals done in dot design. Chest body area has a flat surface on which you can show the stunning design of a Mandala. These tattoos have different significant meaning depending on whether you are a Christian, Buddhist, Hindu or of any religious beliefs. 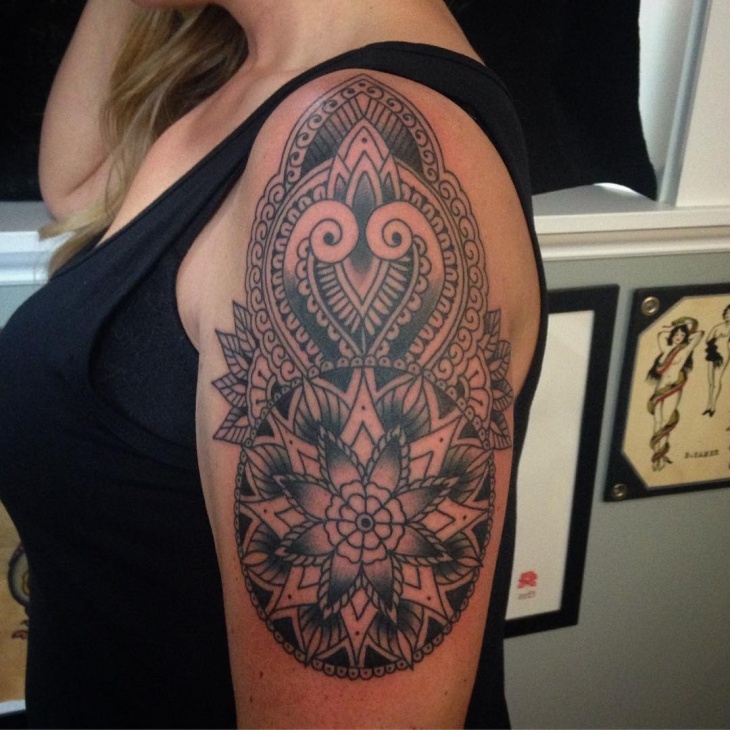 Whether done on the back, chest or sleeves, Mandala tattoos are beautiful. They feature circles which are part of many religions and cultures. These tattoos get their inspiration from artwork and symbols of Native American, Hinduism, Christianity and Buddhism. 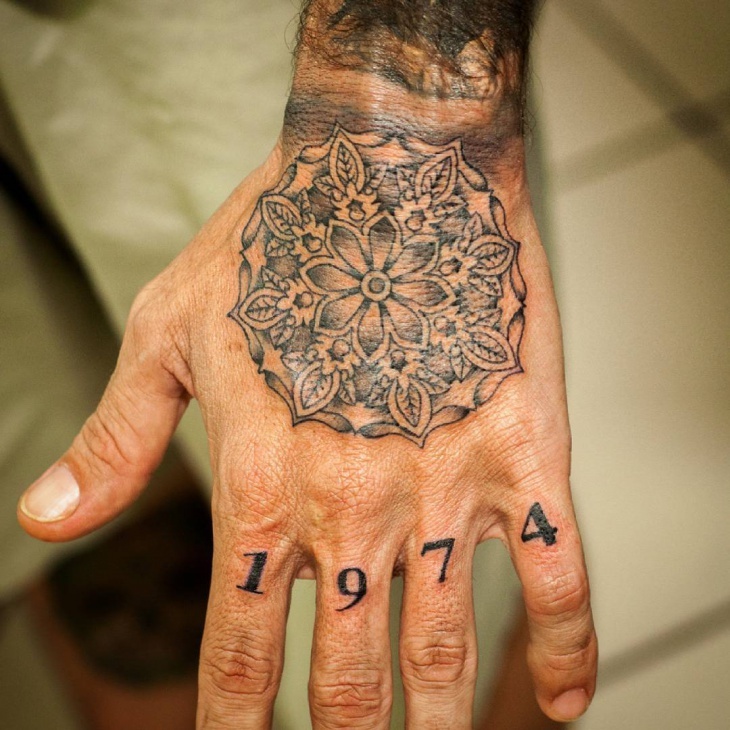 Even though mandalas have a floral pattern, men can still get this artwork as sleeve tattoos.